Rango is a refreshing new animated movie that doesn’t feel like every other kid’s movie that comes out these days. It is mature enough to appeal to the adults as much (if not more than) their kids. Not only do many of the characters smoke cigars, confide in bars and point guns at each other, but the film itself contains endless references to classic movies. There are shots right out The Good, the Bad and the Ugly, the music emulates the score to Once Upon a Time in the West and the story (for the most part) is the plot of Chinatown. 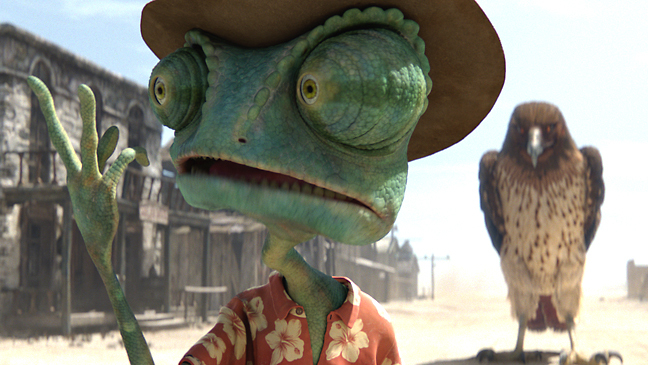 Rango uses these ‘western-movie’ styles and idioms much to the same effect that Kill Bill Vol. 2 used them to create a respectable homage to genre. The story follows a chameleon who begins without a name or identity. He spends the first half of the movie trying to blend in (figuratively and literally since his is a chameleon). He eventually gives himself the name of Rango and poses as a sheriff in a small western town where he attempts to solve why there is no more water left there. Eventually the mystery gets solved but only after Rango begins to existentially question his own true identity in a few fantastic scenes later in the movie. As a whole, the movie is quite funny. Some of the comedy comes from Rango himself (as voiced by Johnny Depp who seems to be channeling Kermit the frog), but most of the jokes come from the side characters. For once, the characters weren’t designed so that the producers could sell a lot of kids toys after the movie. These are some of the ugliest yet coolest designed creatures, and this makes everything they say even more interesting and funny. I of course couldn’t help but enjoy the mariachi trumpet-playing owl.